Mentioned for the first time in 1792, when the Commandery of Rixheim was declared National Property, the park was alternately characterized as JARDIN A LA FRANCAISE then JARDIN A L'ANGLAISE. At that time it was composed of different gardens, ponds and a greenhouse to shelter the rare plants that inspired the draughtsmen and the engravers of the Zuber wall paper Manufacture; during the whole 19th century it was a place of very high botanic richness. 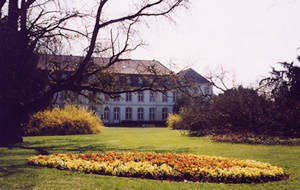 As a property of the City of Rixheim, the Park is today a pleasant leafy setting in the middle of the town. Sundays and official holidays, from 2 pm to 6 pm.